Israeli soldiers invaded, on Tuesday at dawn, several areas in the occupied West Bank, including occupied Jerusalem, and kidnapped seven Palestinians.The soldiers invaded the southern West Bank city of Hebron, and nearby Beit Ummar town, broke into and searched dozens of homes, and kidnapped two Palestinians. Media sources in Hebron said dozens of soldiers invaded various neighborhoods in the city, and kidnapped Anas Nimir Mujahid and Mahmoud Azzam al-Haddad. The soldiers installed roadblocks in the city, interrogated many Palestinians, and searched many cars. The soldiers also fired gas bombs and concussion grenades during clashes with several school students in the city, causing scores to suffer the effects of tear gas inhalation, especially near the Ibrahimi Mosque, in Hebron. Coordinator of the Popular Committee against the Wall and Settlements in Beit Ummar town, north of Hebron, Mohammad Ayyad Awad, said the soldiers invaded Mothallath al-‘Ein area before breaking into the home of resident Nasri Sabarna, and searching it. The soldiers used excessive force while searching the property, leading to an argument that developed into a scuffle, and the soldiers kidnapped three of Sabarna’s sons, identified as Rashid, 31, Yousef, 29, and Roshdi, 21, before taking them to the Etzion military and security base, north of Hebron. The army also installed roadblocks on the main entrances of Sa’ir and Halhoul towns, in addition to the al-Fawwar Junction and Hebron’s northern entrance, before stopping and searching dozens of cars, while investigating the ID cards of the passengers and interrogating them. 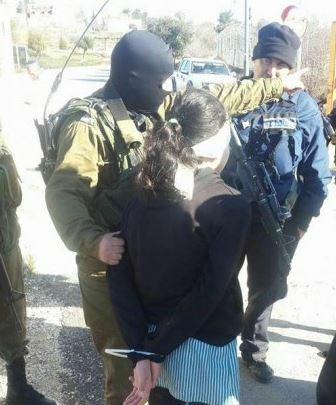 Furthermore, the soldiers kidnapped a school student while walking near Karmie Tzur illegal colony, built on Palestinian lands, allegedly after they searched her and “located a knife in her bag.” The army said the child, 12, was moved to an interrogation facility. She has been identified as Deema al-Wawi, from Halhoul, north of Hebron. In related news, the soldiers invaded Qabatia town, south of Jenin, broke into the home of Hasan Ashour, and searched it while interrogating him and his family. The invasion led to clashes between the soldiers and local youths; the army fired gas bombs and several live rounds; no injuries were reported. In Ramallah, the soldiers installed a military roadblock near a local school, close to settlement road #443, west of Ramallah. The Israeli allegation was proven false after a review of the school’s surveillance tapes.